I'm sorry that I have not been posting weekly. Having the kids home all summer made writing difficult--then school started and that has actually been a big distraction (along with the beautiful fall weather!). I am going to try and get back into a rhythm. A tension is building in Jennifer's diaries. Driven by perfectionism and fueled by loneliness--she is heading down a dark path. I want to follow her there with my little flashlight of perspective, to try and understand how a teen decides to end her life. If a walk down this path with Jennifer will save just one teen from a similar fate--it will all be worth it!! "I'm so sorry that I've been neglecting you. It's like I don't have a lot of time. I bring journal to school and to every class so I'm afraid he gets more attention than you. Lately I'm feeling so worthless and alone. I don't have any real friends here. Jennifer is like a friend but I'm not really comfortable with her yet. I need some good friends like Cheri, Katie and Lara. I really do miss Lara. She is a very special friend. I know I've put her down before but that was because no one at school liked her. I've decided that I can't give a damn what people think. Lara is a good friend and a person too and I really like her though she does get on my nerves sometimes. I semi-hate Wayzata. I'm so down and I guess people pick-up on my unsocial attitude. I hate feeling like this. I want to go back to California. I know I won't do it though. That would be running away from my problems here. I can't talk to my mom because she annoys me too much. I've become obsessed with the way she annoys me. I hate myself for it but I can't help it. Mom seems different now. I just can't stand the things she does. I wish I didn't get annoyed so easily. Jeff's obsessed with parent-child relationships. He'll do nice things for us but when we ask for a favor, Jeff thinks that we're winning some kind and battle and refuses to do it for us. I don't think he realizes how much he complains about us. I want friends so bad and I hate this dumb condo. I can't wait 'till Christmas vacation to go to California and see my old friends. I'm so ugly and my hair is still short and looks bad and my body is really dumb. I'm doomed to grow up like my parents. I want some friends, some security. I don't have any incentive to get up in the morning. I'm so alone. Love, Jennifer. Jennifer met the other Jennifer on her bus route to high school. Even though she liked Jennifer a lot, the friendship didn't fill her void right away. Jennifer was tired of meeting new people. She was fifteen and everyone she met had only known her a month. No one "remembered" her from previous grades, had met her siblings, had run track with her. She was tired of starting from scratch. She was a girl with no history and no identity in a high school with 1700 students. "Last weekend I stayed with Angela in Winona. I went there on the train and came back on the bus. I had no school Thursday and Friday, yea! Friday we went shopping and saw Agnes of God, a pretty good movie. Saturday we went bluff climbing, which was funner than I expected. I also went with her to a Catholic mass. It was very interesting but the priest didn't teach anything, everyone just recited. I did learn more about Angela though. She is a fun loving person and though she is very pretty, she has a lot of ugly friends. She is more genuine than I thought too. I like her more now cause I understand her better. She's pretty carefree and she's a nice person. She walks really straight and tall and always looks real confident. It used to intimidate me but now I know it doesn't come from her thinking she's better than other people. Well, I have a lot of homework everyday. I'll try very hard to write in her more often. I'd put you in plain sight to help me remember but I'm afraid that someone will read you. Love forever, Jennifer." Angela is Jennifer's step-sister. She's about six years older than Jennifer. She must have been around 21 at the time of Jennifer's visit. Angela attended Winona State University. She was pretty, confident, social and professional. Everything Jennifer was not! For Minnesota, these are big hills! 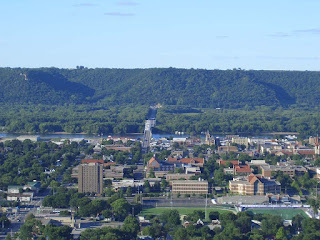 Winona, Minnesota on the Mississippi river. Winona is named after a real Indian Princess. 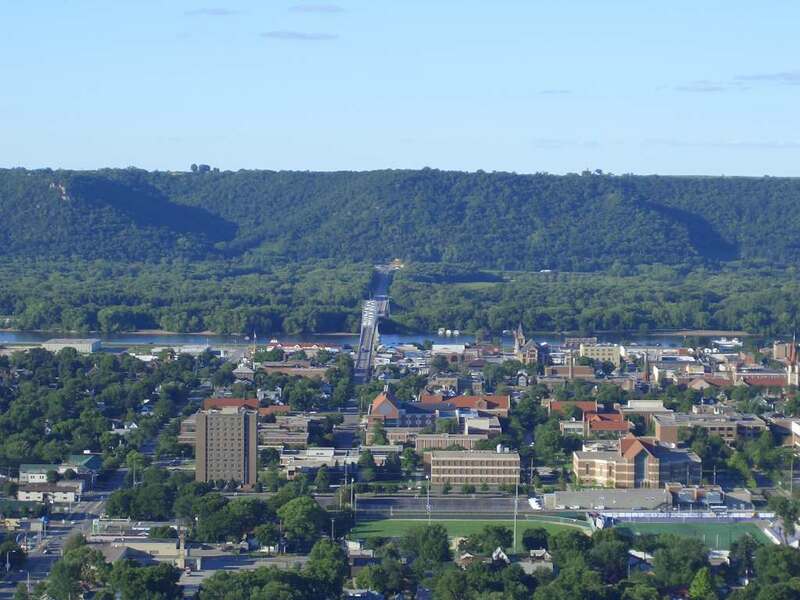 Jennifer's trip to Winona was 150 miles each way. She went by herself which didn't bother her at all. She was used to flying alone, going to school alone and just being alone in general. I think the loneliness played a huge role in Jennifer's deepening depression. Hi Jen: Remember I told you at church a few months ago that my boys refuse to walk into the church with me now that they are teenagers and you said yours were under 12 so they still thought you were OK? I think Nick might be exempt from the teenage chill factor. I hope he is doing OK with his insulin. What a nice young man! Did you see the 7th Day Slumber concert last month? The main theme was teenage suicide, and almost 200 kids came forward and got down on their knees to accept Jesus as Savior. I think Joseph Ramos and his testimony about his own suicide attempt is doing miracles in his ministry and I know that your honesty about your own teenage angst will help someone deal with theirs. I always enjoy your blog so much. Thank you for reading The Jennifer Diaries! Jennifer grew up in California, Colorado, Alaska and Minnesota. Hot off the Presses, the media loves Jennifer! The Jennifer Diaries, 1978-1992 by Jennifer Alvarez is licensed under a Creative Commons Attribution-Noncommercial-No Derivative Works 3.0 United States License. Jennifer Lynn Alvarez. Simple theme. Theme images by alacatr. Powered by Blogger.